Emilia-Romagna is the heartland of northern Italy and it's famous for its food, such as prosciutto, Parmigiano Reggiano, Tortellini and the oldest University in Bologna. Set between Lombardy and Tuscany, and stretching from the Adriatic coast almost to the shores of the Mediterranean, Emilia-Romagna is the heartland of northern Italy. 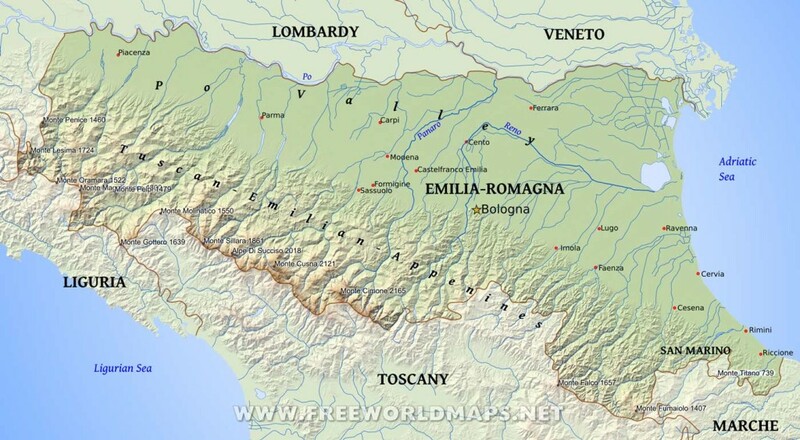 It is two provinces really: Emilia to the east and the Romagna to the west – the former Papal States, joined together after Unification. Before the papacy took charge in the area, it was a patchwork of ducal territories, ruled over by a handful of families – the Este in Ferrara and Modena, the Farnese in Piacenza and Parma, and lesser dynasties in Ravenna and Rimini – who created sparkling Renaissance courts, combining autocracy with patronage of the arts alongside a continual jockeying for power with the Church. Their castles and fortresses remain, preserved in towns with restored medieval centres which, apart from a few notable exceptions, are relatively off the tourist track, since many visitors are put off by the extreme weather (searingly hot in summer, close to freezing in winter), or are sidetracked by the more immediate pleasures of Tuscany and Umbria. The region’s landscape is a varied one, ranging from the foothills of the Apennine mountains in the south to the flat fields of the northern plain, the Pianura Padana, interrupted only by windbreaks of poplars, shimmering in the breeze. The area has grown wheat since Roman times, and nowadays its industry and agribusinesses are among Italy’s most advanced – there are currently more pigs than people in the Po Valley. Emilia-Romagna remains one of the richest regions in Italy, holding some of the country’s most successful small-scale, specialist industrial enterprises. The north of Emilia-Romagna is less interesting than the Via Emilia stretch, the Po disgorging into the Adriatic from its bleak delta (which it shares with the Veneto), a desolate region of marshland and lagoons that is mainly of appeal to birdwatchers. However, Ferrara, just half an hour north of Bologna, is one of the most important Renaissance centres in Italy, formerly under the tutelage of the Este family; and Ravenna, a short way east from here, preserves probably the finest set of Byzantine mosaics in the world in its churches and mausoleums. The coast south is an overdeveloped ribbon of settlement, although Rimini, at its southern end, provides a spark of interest, with its wild seaside strip concealing a surprisingly historic town centre. None of this comes cheap, though: Emilia is a wealthy area that makes few concessions to tourists; the tone is, rather like Lombardy to the north, well mannered, well dressed and comfortable. If you need to economize, it would be a shame to stint when it comes to food, which is where the region excels. Italy’s Emilia-Romagna region is often ignored by visitors, but it is rich in history, natural beauty, artwork and architecture spanning centuries. And it is the home of some of the culinary cornerstones of Italian cooking. Join Zeneba and Matt as they take readers off the beaten path to find the deeper, more authentic, and most delicious adventures. This book bypasses the bigger locations – such as Bologna and Ravenna – in favor of smaller towns, hard-to-find sights, and traditional Emilia-Romagna cuisine. This is the Little Roads Europe experience – authentic, immersive, memorable, affordable. © Italiamia.com. All rights reserved.